Sometimes it's good to be a pack rat. 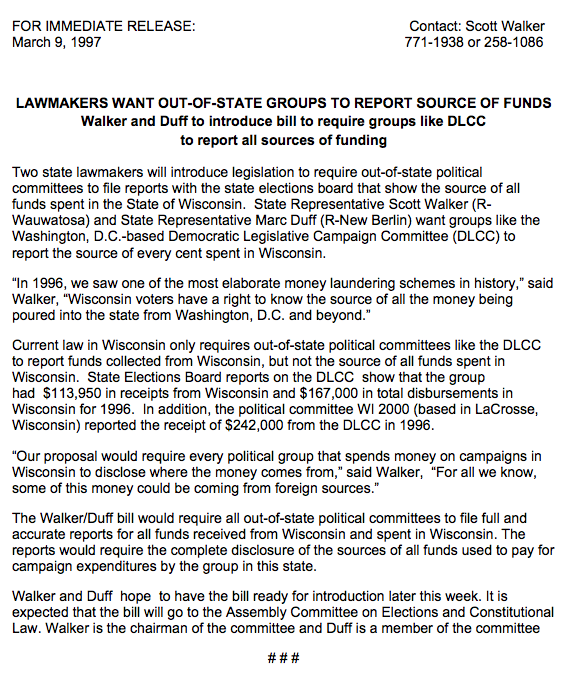 In sorting through the CC/WI office recently, we came across a press release from then-State Representative Scott Walker (R-Wauwatosa) proposing that all out-of-state groups that spend money in Wisconsin elections disclose where those funds came from. He strongly supported the type of full disclosure of the donors of outside money that Wisconsin has needed for two decades. While back in 1997, State Rep. Walker strongly supported electioneering disclosure, Governor Walker has been much less supportive. In fact, he and his allies have been major impediments to providing information voters need about who is behind the millions of dollars being spent in Wisconsin elections – particularly in gubernatorial elections. Governor Walker could learn something from State Representative Walker. Below, verbatim, is the March, 1997 Walker press release on his disclosure legislation. Needless to say, it didn't get very far back then and that's a major reason we have so much secret money in Wisconsin today. State Rep. Scott Walker Introduced Bill Requiring All Out-Of-State Groups to Report Source of FundsTweet this!